SAN JOSE, Costa Rica — Ricardo Rudin Mathieu ran a racket. He put labels bearing the U.S. Department of Agriculture’s organic seal on boxes of pineapples grown conventionally with chemicals. Before Rudin was caught, he managed to export more than 400,000 of the phony organics to the United States and Canada — enough to supply a pineapple to every resident of New Orleans. Rudin confessed in 2014, USDA records show. Then something remarkable happened. The agency did nothing to him. Like others responsible for what appears to be a rising tide of fakes in the $43 billion U.S. organic food market, Rudin escaped consequences for duping U.S. consumers, who pay steep premiums for food that may not meet the promise of the USDA seal. The USDA records show that a year into a meandering three-year investigation, agency managers told Costa Rican officials they had no idea whether Rudin continued selling conventional fruit as organic. A former business partner has filed a lawsuit against Rudin, 42, accusing him of mislabeling produce again, exporting 40,000 conventionally grown pineapples to the U.S. last year at a 100% markup. He’s moved on to bananas and I believe avocados and plantains, from what we know. “He’s moved on to bananas and I believe avocados and plantains, from what we know,” William Umana Aguirre, co-owner of Packing House Gala Gold in Costa Rica, told NerdWallet. Umana accused Rudin last year of misappropriating company money to export phony organic pineapples using another supplier’s certificates. He says he reported Rudin to judicial authorities but they have not taken any steps against him. “I really need to get this guy shut down, but nobody does anything,” Umana said. Rudin denied all of Umana’s accusations. The Rudin case exemplifies the weakness of the USDA’s enforcement system, as purveyors succumb to the temptations of profiting from forbidden fruit, a NerdWallet investigation found. Markups are so high — anywhere from a third to almost triple, at retail — that swindlers belly up to the organic trough, with little to fear if they’re caught. Such temptations extend to the 80 powerful certifiers the USDA authorizes to inspect organic operations worldwide. Those certifiers are accredited by the agency but then chosen and paid by the organic companies themselves, creating a conflict of interest. Among the findings of NerdWallet’s four-month investigation: Some consumers who pay extra for organics are bilked and don’t know it. Honest organic farmers are undersold and struggle to survive. And cheaters are emboldened as culprits walk and the USDA organic seal loses credibility. 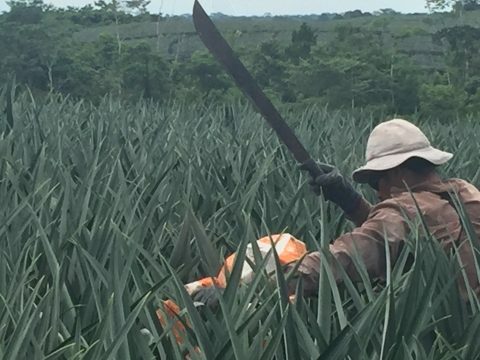 A farmworker in a Costa Rican organic pineapple field. Fake organics involve far more than just pineapples. The Washington Post reported in May, for instance, on a load of conventionally grown soybeans shipped to the U.S. and sold as organic at a $4 million premium. Watchdog organizations such as The Cornucopia Institute in Wisconsin say that dairies and egg producers break organic rules while managing cows and hens. “This industry is way, way out of control,” said Pat Dockstader, managing partner of USDA-certified Doc’s Organics LLC, whose sister company, P&T Enterprises in California’s Imperial Valley, farms 800 acres of lemons and other organic fruit. “I’ve been around a few campfires where guys say, ‘Well, how much nighttime spraying do you do?’” said Dockstader, referring to secret application of chemicals banned for organics. He says he doesn’t do any. Merely by relabeling, a dishonest competitor can get $35 for a $25 box of conventionally grown lemons, Dockstader said. NerdWallet investigated the Rudin case by interviewing him and others involved, and by examining hundreds of pages of emails, documents and photos the USDA released in response to public records requests. NerdWallet’s investigation also found another glaring example of USDA inaction, also involving Costa Rican pineapples. In the separate, ongoing mess, PrimusLabs, the same certifier as in the Rudin case, is accused by a Costa Rican government investigator of improperly certifying a big farming operation, allowing millions of dollars of bogus organics to reach the United States. Rudin’s scam was simple, USDA records show. Acting as a middleman between Costa Rican suppliers and U.S. importers, he got hold of organic certificates issued to other companies. Then he presented them as proof his pineapples were worthy of the USDA seal, the gold standard in organics. Marc Beesley told the USDA he became suspicious that large pineapples had not been grown organically. It worked for a while. But in October 2014, Marc Beesley, an American businessman who helped pioneer Costa Rica’s organic farming industry, grew suspicious. His firm sent reports of suspect fruit to the USDA and to Primus headquarters in Santa Maria, California. The company, which certifies about 100 organic outfits in the U.S. and abroad, now does business as Primus AuditingOps, an all-purpose industrial auditor. 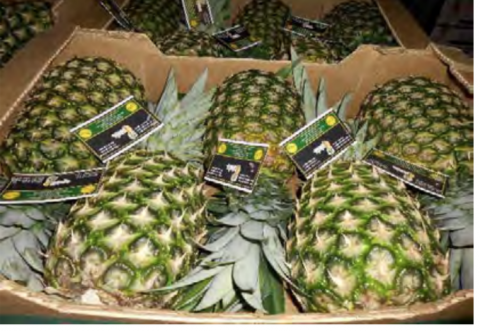 Beesley, Costa Rica-based managing director of CAPA LLC, a pineapple exporter, importer and producer, told the USDA and Primus that a salesman had offered his company’s U.S. branch “organic” pineapples in impossibly big quantities. Only a giant “mystery farm” that no one knew about could produce that much, said Beesley, who also noticed that the fruit was abnormally large. The “five count” pineapples — grown so big that only five fit in a standard-size box — struck Beesley as red flags. Costa Rica’s organic farmers hadn’t yet found a way to feed plants enough natural nitrogen to consistently produce fruit that big. In that year’s hot market, Beesley knew, Costa Rican exporters who charged $15,000 for a shipping container of conventional fruits could get $24,000 for the same load marked organic, a 60% premium. At retail today, a regular pineapple that would sell for $2.40 could fetch $3.80 as an organic. Primus began investigating by conducting a surprise inspection of one of Rudin’s suppliers. However, the certifier neglected to inspect a second implicated company, according to the USDA’s overseer of certifiers. 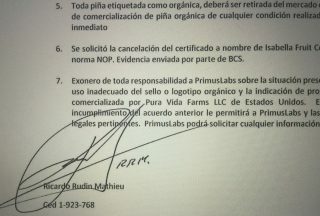 Primus extracted the confession in the form of a private letter to its Costa Rica manager from Rudin, who wrote that he absolved Primus of blame in the labeling scam. Primus submitted it to the USDA. The USDA investigated from its headquarters in Washington, D.C., where the agency’s outgunned staff has just one compliance officer for every $9 billion of U.S. organic-labeled food. The USDA assigned an inexperienced investigator who struggled with secondhand information. The case plodded on and on. “It’s been taking up quite a lot of my time!” Karin French, one of the National Organic Program’s five backlogged compliance officers, wrote in a December 2014 email, aiming to reassure a U.S. importer who worried that the trail was going cold. French, a former program analyst, had a master’s degree in animal science. She had been a social media moderator and a web marketing consultant. The 17 skills listed on her LinkedIn site do not include investigative abilities. French worked the Rudin case until transferring in January to an agency grants-management job. The case file contains no indication that she or others from the USDA traveled to Costa Rica. Files released at NerdWallet’s request contain numerous emails in which French requested elementary information from Primus and others, showing that the USDA lacks an enforcement database with timely information on organic operators and certifiers. And the files include glimpses of bureaucratic fumbles, including USDA enforcement managers stymied by a lack of response from the Costa Rica Ministry of Agriculture and Livestock — until a ministry official pointed out they were emailing defunct addresses. USDA spokespersons declined after three months of repeated requests to make officials available for interviews concerning the pineapple cases and the systemic issues they raise. Primus did not respond to repeated requests for comment. The USDA closed the case Aug. 3 during a drive to reduce a backlog. The case closure memo said that organic certificates were suspended for two Costa Rican companies. David Glasgow, USDA agricultural marketing service public affairs director, identified the two as Isabella Fruit Co. and Productos Organicos de Exportacion Pura Vida. Glasgow didn’t mention it, but USDA records show that a third company in the Rudin investigation, Exportaciones Pina Tica, lost certification. After USDA officials discovered during the investigation that Primus had improperly certified Pina Tica, they dinged the certifier with a noncompliance, but the agency subsequently reaccredited the certifier. In an example of the agency’s disarray, NerdWallet searches of the USDA’s Organic Integrity Database, an online resource promoted by the agency as a tool consumers can use to check on the integrity of organic operations, produced no listing for Isabella or Pura Vida. In an interview with NerdWallet, Rudin said he never suffered any consequences. The USDA even redacted his name in records releases to protect his privacy, under a Freedom of Information Act exemption. Large “five count” pineapples struck Beesley as a red flag. Rudin denied his former business partner’s allegations that he mislabeled fruit again last year by misrepresenting certificates of a USDA-certified supplier — accusations that the agriculture ministry investigated but a judge declined to pursue. Rudin also denied relabeling and selling other types of fruit. USDA failings are all too familiar to the Organic Consumers Association, a nonprofit formed 20 years ago as federal officials began regulating organic food, replacing scattershot local certifications. “We have spent our entire lifetime as an organization having to run campaigns against the federal government to get them to do their jobs on organics, whether it’s regulation or enforcement,” said Alexis Baden-Mayer, Organic Consumers Association political director for the OCA. “Certifiers are the smartest people in the room, but they are close to the industry and don’t always do what’s right as representatives of consumers,” Baden-Mayer said. Costa Rican officials also criticize the USDA. Gina Paniagua Sanchez, Costa Rican deputy agriculture minister, warned in an email to the agency that scams like the Rudin racket could recur if U.S. border officials didn’t compel importers to prove each shipment organic, as the European Union does. The USDA, however, has not followed the lead of the European Union, which requires organic importers and brokers to be certified as well, in addition to growers, processors and handlers. The USDA does process compliance complaints, recently obtaining a $1.8 million civil penalty against a Texas corn chip maker whose fine will drop by three-quarters if it complies with regulations for a year. The agency reported levying $187,500 in negotiable fines during the year ended Sept. 30. The USDA also occasionally revokes or suspends certifiers that don’t meet requirements. U.S. Rep. John Faso, R-New York, is sponsoring legislation to address some of the USDA’s problems regarding fake organics. House Bill 3871 would boost the agency’s budget to computerize organic certificates for better tracking of international shipments. It would improve coordination among federal agencies for enforcement, and strengthen USDA oversight of its certifiers’ foreign branches. Congress is partly to blame for failing to increase organic enforcement funds to keep pace with explosive market growth, Pingree said. On the Senate side, Pat Roberts, R-Kansas, chairman of the Committee on Agriculture, Nutrition and Forestry, said at a July hearing that “uncertainty and dysfunction” had overtaken the U.S. organic system, creating an unreliable regulatory environment. Attempting to determine whether organic imports are laced with more fakes than domestic products is like trying to count fruit worms. But Pingree and others believe that chances are higher. Rudin signed a letter admitting to the labeling scam and absolving Primus of blame. Producers such as Dockstader, the California organic grower, believe that opportunities for fraud are greater in hotbeds of corruption — opening the door to more sinister forces, which can seize an advantage via the USDA’s flawed certification system. Criminal organizations can pay illicitly gained funds to exporters whose organic exports provide both money laundering and additional profit, he and others in the industry said. “If the cartel tells you, ‘You’re going to ship it or I’m going to put you 6 feet under,’ well…” said Dockstader, leaving the rest to the imagination. 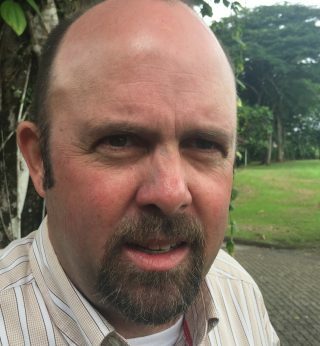 Beesley, the American expatriate who spotted the Costa Rican fakes, said that in light of such dangers abroad, credit should go to foreign producers and officials who summon courage to call out fraud. “The last thing we want to show the world is that you can’t trust anyone from Costa Rica, and that organic from here is just a big joke,” Beesley said. Photos of farmworker and Marc Beesley photo by Richard Read, NerdWallet. Photos of pineapples and confession statement: released by the USDA in response to NerdWallet’s Freedom of Information Act requests.